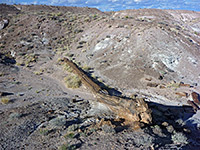 On first impression, the Petrified Forest may not sound very appealing as it comprises stone log fragments scattered over a rather remote and otherwise featureless section of Arizona desert. Apparently it comes as a disappointment to some who expect the trees still to be standing in thick rocky groves instead of lying flat in sections as they are. But the petrified logs are extremely beautiful with most unexpectedly bright colors, and the park contains a section of the scenic Painted Desert so it is well worth a visit especially as the site is quite easily reached, being close to the main east-west route interstate 40. 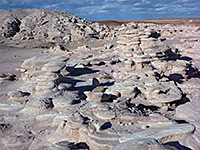 A 27 mile road runs through Petrified Forest National Park, from exit 311 of I-40, south to US 180. The surroundings are for the most part empty grasslands, and the closest town is Holbrook, 26 miles to the west. The visitor center is at the north end and there is a small museum at the south entrance. In the north, the first few miles of the road wind along the rim of a mesa overlooking the Painted Desert, past 8 viewpoints of the rolling multicolored landscape, with one short trail along the cliff edge. 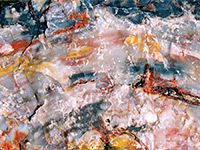 The patterns visible in the eroded soft sedimentary rocks are due mainly to hematite (red), limonite (yellow) and gypsum (white), and the colors are especially striking at sunset. The park boundaries have been extended twice, in 1932 and 1970, to include a large area of the desert to the north, and although there are no maintained paths in this region, off-trail hiking and back-country camping are permitted; the main destination is the Black Forest, which has large amounts of petrified wood, darker in color compared to other locations, and including many complete trunks, together with badlands and photogenic, eroded rock formations. Also in this area is Onyx Bridge, a 40-foot tree that spans a dry wash, though the log partially collapsed a few years ago. 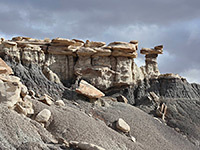 One more recently accessible destination (free permit required) is the Devils Playground, an area of badlands and hoodoos near the west edge of the park, reached from I-40 exit 303 and explorable by a 7 mile partial loop hike. 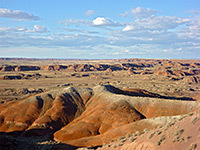 The Painted Desert extends about 150 miles across northeast Arizona, from the Petrified Forest towards the Little Colorado River, Tuba City and beyond. After the final overlook of the Painted Desert (Lacey Point), the park road turns due south, crosses the interstate and a branch of the Atchison, Topeka & Santa Fe railway, then passes through the petrified region. 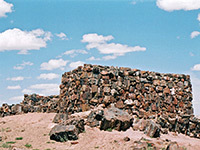 The first feature of interest is an Indian ruin - Puerco Pueblo, originally a collection of 76 rooms and a kiva - which is toured by a 0.3 mile loop trail, and is just one of over 500 archaeological sites within the park. Another is found 1.5 miles south at Newspaper Rock, a sandstone outcrop bearing hundreds of petroglyphs dating from around 1000-1300 AD. There are more petroglyphs along a short side track close to the south edge of the park (starting from Giant Logs museum), but the main viewpoints along the southern section of the park are of the petrified wood. Unusually for a national park, there are no extended trails in the area, only short paths close to the road. Partly to protect the natural resources, there are no developed campsites in Petrified Forest National Park; the only camping allowed within the park is for backpackers in the Painted Desert/Black Forest wilderness area, north of the interstate. The surrounding land also has patches of petrified wood, and is privately owned and fenced off, so there is no place for free camping nearby. The closest options for this seem to be one of several junctions of I-40, either side of the park turn-off - exits 303, 320 and 325, each of which has short tracks leading into the desert where overnight parking/camping is possible. Nearby Holbrook has about ten hotl choices - best is the Holiday Inn Express Holbrook along Navajo Boulevard, just north of I-40 (exit 286) and 25 miles from the northern entrance to the national park. The hotel has 59 rooms, was renovated in 2006, and is within walking distance of the center of Holbrook, which is a small town but has a fair selection of restaurants and shops.